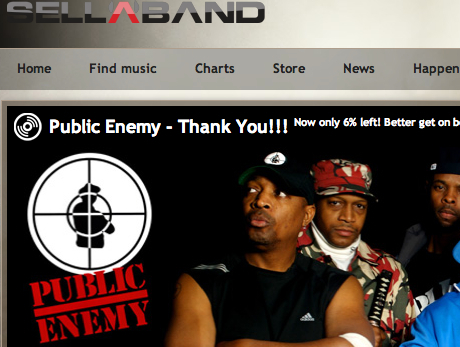 Almost a year ago Sellaband, the number one crowd-funding website for musicians went bankrupt. The website was then acquired by a German company and now Public Enemy managed to raise $75,000 despite all the problems of the past. Is this the future of music business? It very well may be. Okay, so you have a band. You will not get signed unless you know someone who will push you in. Even if you make super music traditional publishers just don’t sign bands any more. No one buys CDs any more. Why would anyone? Publishers are without money. Artists realized long ago that money is rather in playing gigs than selling CDs. Your band is in trouble unless you find a way to raise sufficient funds to finance a record. Sellaband provides a platform for that. Bands sing up and start raising money, “believers” invest in them and hope that the band will succeed in selling a lot of CDs and generate revenues. When the budget is reached the band will spend the money on studio time, promotion, gigs, etc. and of course every investor will receive a CD. Revenues are shared depended on how much you invest. The business model is clear, the only thing that’s missing is sales. This of course would not be a problem for Public Enemy or other artists with a name. Unfortunately it doesn’t matter where the money comes from, people are just not buying CDs any more. Of course you can sell your album online as well. Apparently Sellaband does that for you when you release your record.